P. Mauriat endorser Marco Pignataro Jazzet Album entitled "Almas Antiguas" (Zoho Music) is on the 61th Grammy Ballot for Best Instrumental Jazz Album. The CD feat. Eddie Gomez (bass) - Alan Pasqua (piano) -Adam Cruz (drums) -George Garzone (Ten. sax - 3 tracks). The CD has been presented on CNN en Espanol and featured on the Jazz@Lincoln Center website and has already received several raving reviews internationally. The CD is today available on all major online platforms. It's also listed in the Jazz at Lincoln Center Webpage as one of the September Jazz Album Roundup. 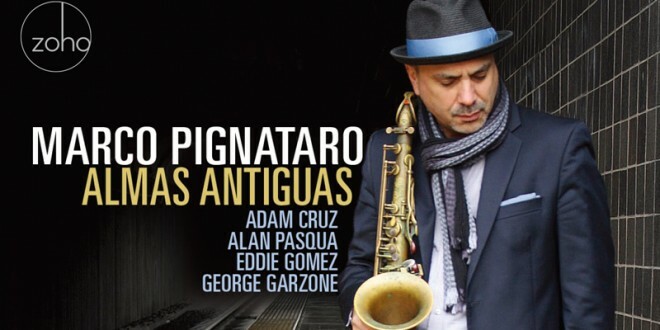 "On his ZOHO debut “Almas Antiguas” (“Old Souls”), Boston based saxophonist Marco Pignataro presents his all-star quintet. Six original compositions and five arrangements tell a “story of love”, signifying on elements of his Italian and Puerto Rican bloodlines. The music is evocative and powerful, blending modern jazz with shades of Mediterranean, folk & Latin influences. A remarkably cohesive, artistic recital, devoted to vivid melodies and lyrical beauty, in which all members illuminate the roiling emotions and romantic sensibility that underpin the songs."